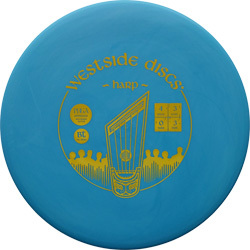 The Harp is our most reliable approach disc. Designed to withstand and type of conditions. It will hold in the wind. In our BT Soft plastic the Harp is very flexible and feels great in your hand. Use the soft in cold weather and it will still have that soft feel. Use the BT stiff in the summer and it will still hold its shape. For professional players this could be there only approach disc they will need to carry as it can hold anyone's arm speed and still hyzer. For slower arms it will be your most over stable approach disc. The second in our BT line the Medium is for all conditions. It has a tacky grip, great durability, and feels fantastic in your hand. In the cold it will still have some give; in the heat it will still hold its shape. Designed for the users comfort BT Medium is just what you need to enjoy your next game. We offer BT in our putters and mid ranges as those two aspects of the game are all about feel. Feel our BT Medium today and you will fall in love.